SCLEROBAY, can because of it's composition considerably help in dissolution of calcified deposits and prevent build-up of new ones. SCLEROBAY synergistic compound of EDTA (ethylenediaminetetraacetic acid) in form of bisodium salt which is proved, when introduced to the cardiovascular system dissolves calcified deposit plaque. dissolved plaque exits the body through the purifying organs. Second part of the compOund is a composition of mineral-bioactivators and fulvic acid. Fulvic acid has the abbility to increase resorption capacity of intestinal laps, which �to allows high input of EDTA into the cardiovascular system, which creates favorable conditions for dissolving of calcified plaque of the blood vessel walls. Rich mineral composition ensures the necessary mineral balance within the organism. This composition, prepared for the first time in the world in this way, by it's efficiency, simplicity of use and availability is hard to compare to any other preparation with this purpose. Sclerobay effect is most pronounced in persons with clogged blood vessels in legs and because of that suffer from frequent and painful spasms. By taking Sclerobay (4 capsules a day) in short time these difficulties are significantly reduced and completely disappear. 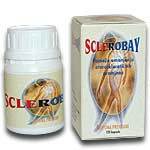 At the same time, by taking Sclerobay power of erection is returned or increased respectively.